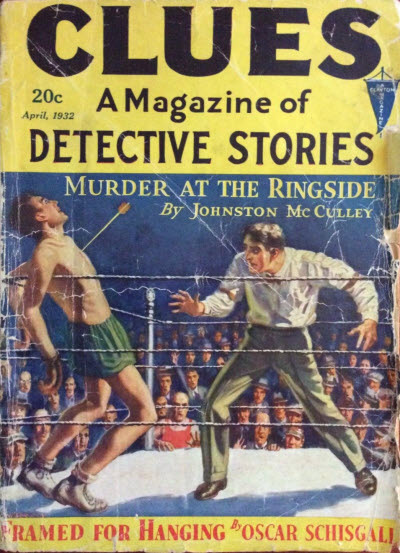 369 · Mosquitos Sting · Garret Smith · ss; illustrated by R. N.
444 · Steamboat Mystery · Edward Parrish Ware · ss; illustrated by R. N.
569 · Via Knuckle Talk · Albert William Stone · ss; illustrated by R. N.
608 · Coppered Bet · Allen S. Jacobs · ss; illustrated by R. N.
629 · The Puzzle Chest · Helen Asbury · pz; illustrated by R. N.
277 · Peanut Pete Leaves a Trail [Peanut Pete] · Johnston McCulley · ss; illustrated by J. T. B. 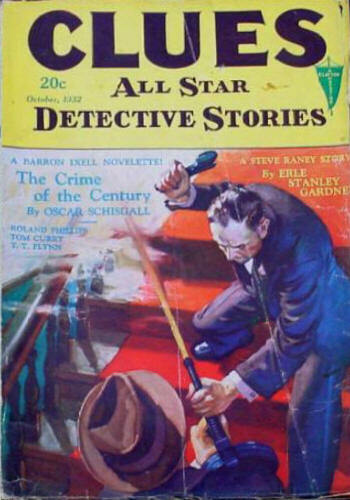 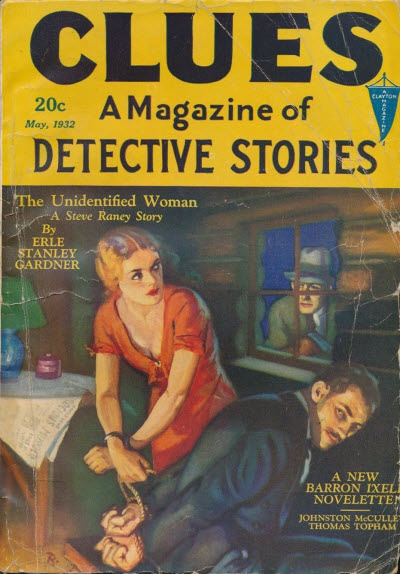 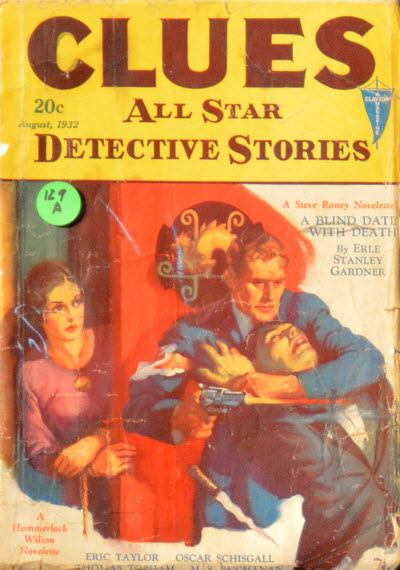 297 · Framed for Hanging [Part 3 of 3] · Oscar Schisgall · sl; illustrated by J. T. B.
Carl Happel - Editor: Clues All Star Detective Stories, Jul 1932  Jan 1933. 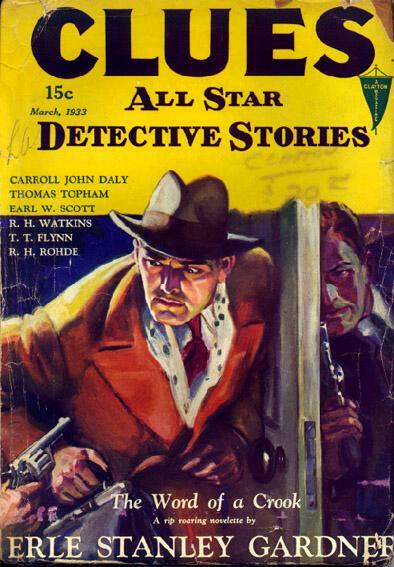 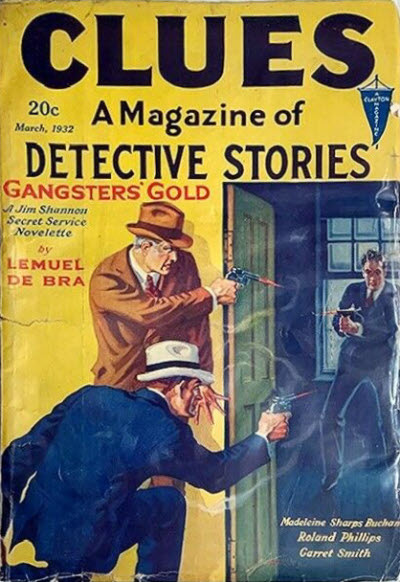 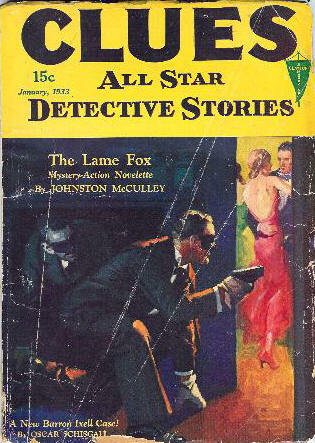 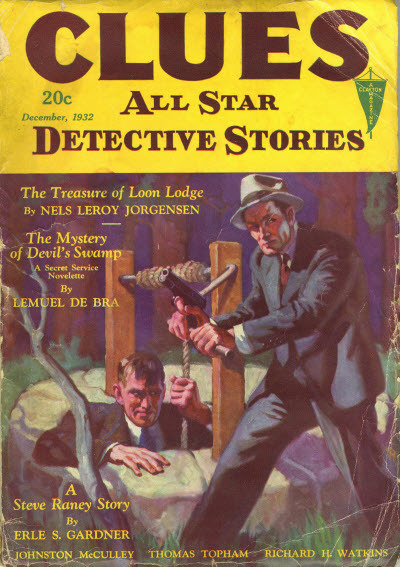 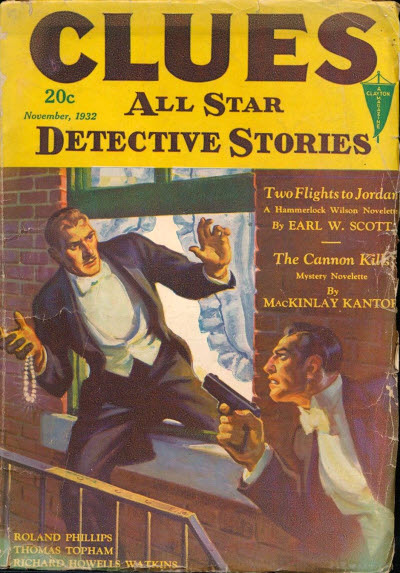 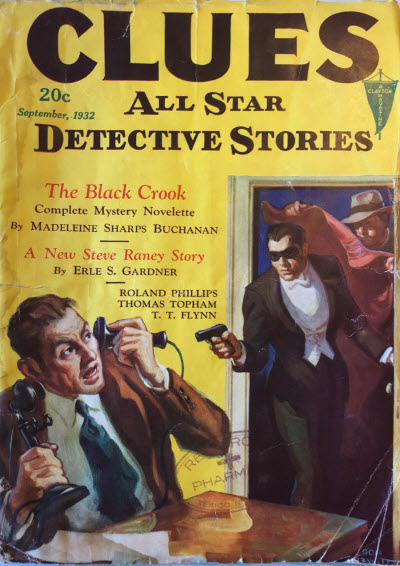 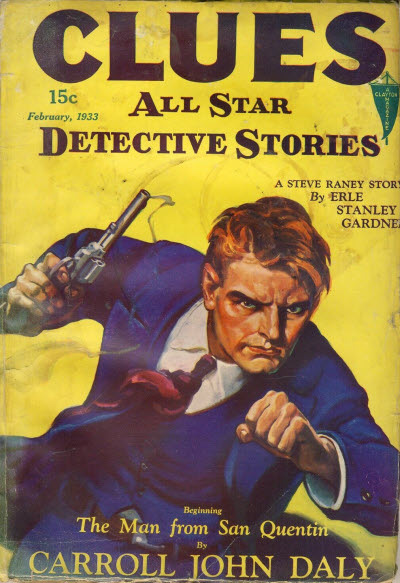 T. R. Hecker - Editor: Clues All Star Detective Stories, Mar 1933  Apr 1933. 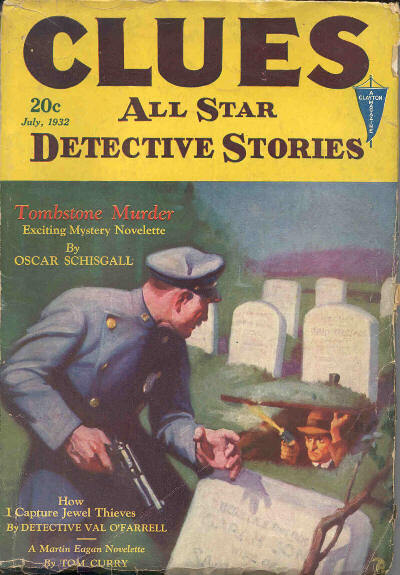 326 · Tombstone Murder · Oscar Schisgall · nv; illustrated by D. H.
385 · He Fell in Love · Thomas Topham · ss; illustrated by J. R. D.
405 · The Man from Penang · James W. Egan · ss; illustrated by J. R. D.
420 · The Missing-Arm Murders [Martin Eagan] · Tom Curry · nv; illustrated by J. R. D.
441 · Signed Bullets · Edward Parrish Ware · ss; illustrated by R. N.
471 · The Puzzle Chest · Helen Asbury · pz; illustrated by R. N.
557 · The Secret Address · Allen S. Jacobs · ss; illustrated by J. T. B. 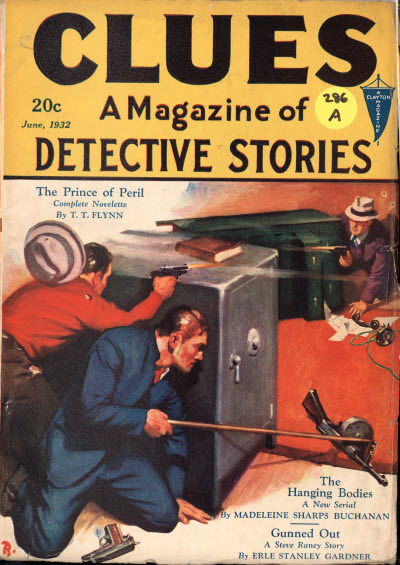 47 · A Nose for Trouble · Leslie T. White · ss; illustrated by J. R. D.
56 · Salt for the Soup · Thomas Topham · ss; illustrated by J. R. D.
107 · An Official Alibi · Garret Smith · ss; illustrated by J. R. D.
153 · The Puzzle Chest · Helen Asbury · pz; illustrated by R. N.
165 · Marked for Murder [Part 1 of 3] · T. T. Flynn · sl; illustrated by J. R. D.
240 · Open All Night · L. G. Blochman · nv; illustrated by J. R. D.
312 · The Puzzle Chest · Helen Asbury · pz; illustrated by R. N.
391 · A Boil on His Leg · Thomas Topham · ss; illustrated by J. R. D.
447 · Marked for Murder [Part 2 of 3] · T. T. Flynn · sl; illustrated by J. R. D.
470 · The Puzzle Chest · Helen Asbury · pz; illustrated by R. N.
521 · Too Much Temptation · Thomas Topham · ss; illustrated by J. R. D.
533 · The Treasure of Loon Lodge · Nels Leroy Jorgensen · ss; illustrated by D. H.
542 · The Man on the Armored Truck · Ray Cummings · ss; illustrated by J. R. D.
556 · Peanut Petes Change of Diet [Peanut Pete] · Johnston McCulley · ss; illustrated by J. R. D.
563 · The Mystery of Devils Swamp · Lemuel de Bra · nv; illustrated by J. R. D.
597 · Marked for Murder [Part 3 of 3] · T. T. Flynn · sl; illustrated by J. R. D.
633 · The Puzzle Chest · Helen Asbury · pz; illustrated by R. N.
55 · Officer Pinky · Thomas Topham · ss; illustrated by J. R. D.
80 · Signals Mean Death [Barron Ixell] · Oscar Schisgall · nv; illustrated by J. R. D.
124 · The Puzzle Chest · Helen Asbury · pz; illustrated by R. N.
123 · The Puzzle Chest · Helen Asbury · pz; illustrated by R. N.